Today I am sharing a simple and easy recipe.Many of my readers have asked how do I make Rasam. 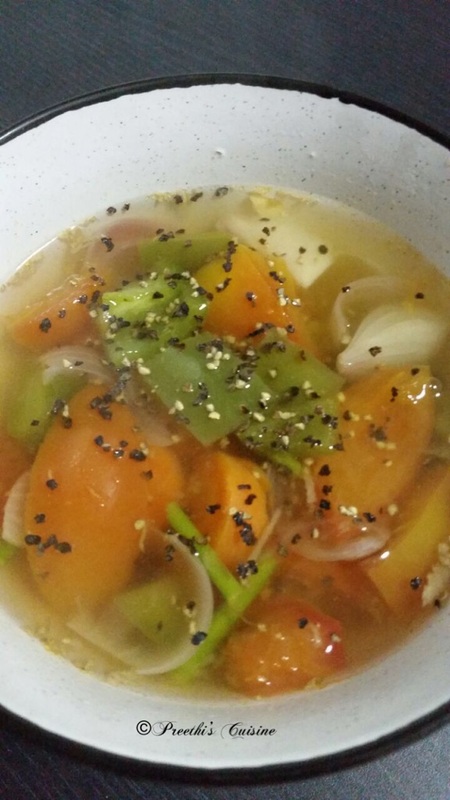 Well i make different types of rasam and this particular recipe I learnt from my better Half Mr RP. He is an occasional cook and whips out some delicious recipes once in a while(Read a very rare occasion ). This recipe can made with easily available ingredients in your pantry.Vathal is store bought.You can make it home if you have an option to sun dry it.I have not tried it yet. There are many types of vathal available in the market. Add water in a wide Bowl . Add the chopped tomatoes and lightly mash it with a masher. Keep this on medium flame. Once it starts to boil add the minced garlic and chopped ginger. Using a mortar and pestle pound the black pepper and jeera till you get a coarse powder. Now add the pepper and jeera powder to the boiling tomato ,garlic and ginger mixture.Keep it on low flame. Now add rasam powder, salt, coriander ,curry leaves and sambar powder and allow it to boil for good 10 mins on low flame. Heat another pan. Add ghee. Now shallow fry the vathal until crisp.Once it is done add the mustard seeds,hing and red chilli for the tadka. Pour this vathal tadka into the rasam bowl. Allow it to boil for another 5-7 mins. Switch off the flame and serve as soup or with rice to soothe your sore throat .This is absolutely light on your tummy and improves your digestion as well. If you cannot find Vathal you may skip it. I use home made rasam and sambar powder.If store bought you may have to add a little more. This proportion is to suit my family’s palate. You can add boiled and mashed Toor dal to the rasam. Soups are healthy and filling and can serve as a quick meal when you are in a hurry. Bored of your regular meals? Hmm.. then this soup is perfect for you.It can be whipped within 20 mins if u have all the ingredients at home and can adjust the recipe to suit your palate.You can add any vegetable or meat of your choice. I am sharing a vegetarian version with you today. I was excited when the theme was decided for this week .My Contribution for #91st #Foodiemonday #Bloghop theme #20minrecipes. I am looking forward to all the recipes which my fellow bloggers will share. Heat Olive Oil in a wok. Add the snow peas and green peas and saute on medium flame for 3-4 mins. Now add the thai red curry paste and mix well.Add the canned lentils and water and allow it to simmer on medium flame for about 5 mins. Once done add the cooked beehoon ,coconut milk and salt to taste. Keep it on medium flame for about 2-3 mins.Switch off the flame. Sprinkle some black pepper or sliced red chillies and serve hot. Autumn or Fall is the season of the year between summer and winter, during which the weather becomes cooler and many plants become dormant, extending in the Northern Hemisphere from the autumnal equinox to the winter solstice and popularly considered to include the months of September, October, and November.While most foods are harvested during the autumn, foods particularly associated with the season include pumpkins (which are integral parts of both Thanksgiving and Halloween) and apples, which are used to make the seasonal beverage apple cider. 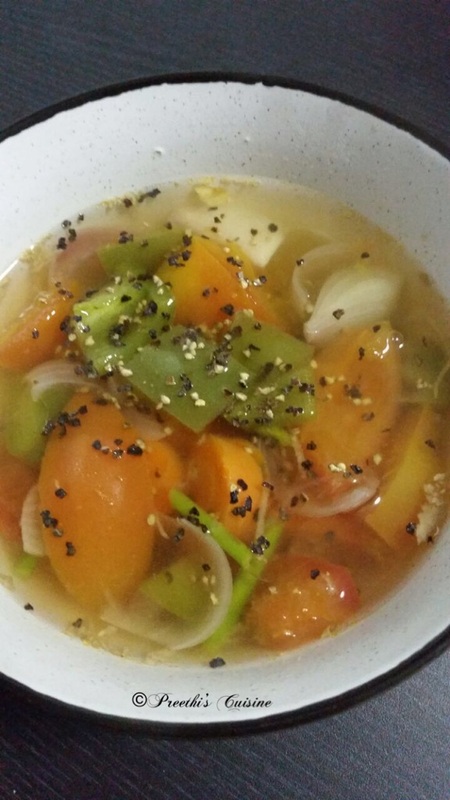 As a part of our 64th #Foodiemonday #Bloghop theme #FallRecipes my contribution is this yummy Mix Veggie Soup which is perfect for this weather. Peel the Butternut Squash and cut it into pcs. Take a heavy bottom pan and add 1/2 cup of water. Throw in the Squash pcs and let it cook on medium flame for 15 to 20 mins .Once done allow it to cool . Blend it into fine paste. Keep it aside. Take a wok. Add 1/2 tsp of oil. Throw in the chopped brussel sprouts and Enoki mushrooms. Add the chilli flakes and coarsely ground pepper powder and roast it on medium flame. Do not overcook. I love crunchy brussel sprouts.Add salt and mix well.Keep it aside. Pout the squash mixture in a soup bowl.Garnish with roasted brussel sprouts and enoki mushroom mixture.Garnish with roasted sunflower seeds and diced baby radish. Enjoy this yummy and healthy soup at the comfort of your home while you enjoy this beautiful weather.